Traditional Gardengate Address Plaque - - grande size 18"W x 9.5"H personalized address sign with one or two lines of personalization. Made in USA. The Gardengate rectangle plaque features traditional styling and simulated carved wood border accents with a hint of formality. The two-line sign holds up to five (5) 3" characters on Line 1 and up to seventeen (17) 1.25" characters on Line 2. Large image Color: GG green with gold characters. Smaller images (from left to right): antique brass, antique copper, black/gold, black/silver, bronze verdigris, black/white, green/gold, oil rubbed bronze, bronze/gold, pewter/silver, red/gold, white/gold. Dimensions: 18"W x 9.5"H x .375". 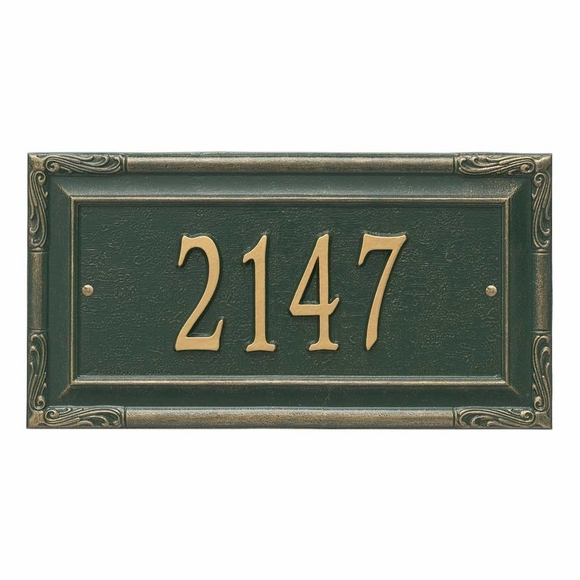 To purchase a lawn mount Gardengate address plaque, click top link in Related Products.